Detectives investigating the shooting of a 17-year-old boy are appealing to the public to help identify seven men who may be able to assist the enquiry. 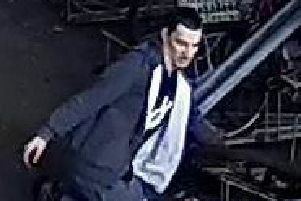 The men were pictured visiting the Wheatsheaf Pub in Peterborough on the day of the shooting and it is thought they possibly have links to Cambridgeshire, Leicestershire, Hertfordshire, Bedfordshire and the Thames Valley region. The incident took place at the Greenfields Traveller site in Braybrooke, Northamptonshire, on July 10, 2016 and left the teenager with life changing injuries. So far 16 people have been arrested as part of the investigation. Fifteen people have been arrested on suspicion of attempted murder, with the 16th arrested on suspicion of being in possession with intent to supply Class A drugs. All 16 have been released on bail pending further enquiries. Detective Inspector Lee McBride, from the Organised Crime and Drugs Team, said: “This was a very serious incident which has left the young victim with life changing injuries. “We have conducted extensive enquiries as part of the investigation and are now asking for the public’s help in identifying the men pictured.